Following the earlier complaints against occupants of the land belonging to Anglican Girls Grammar School by some old students of the school and members of Concerned Edo Citizens, a non-governmental organisation, the former students have called on the Edo State government to extend the demolition notice it has served in some parts of the state to those occupying part of the school land. 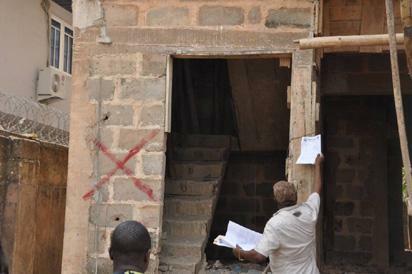 Officials of the Ministry of Physical Planning and Urban Development, marking a building which contravened Edo state’s laws on urban development, in Benin City, the state capital. The building is being marked for demolition after final notice was issued to the developer. The former students appealed to the Governor of Edo State, Mr. Godwin Obaseki, to revoke the certificates of occupancy of all the occupants on the school land to allow space for the future expansion of the school. “The annexation and appropriation of our school land by members of the Peoples’ Democratic Party (PDP) was done in bad fate; it is immoral and a bad way to use political power. If all the preceding administrations shared school lands across the state the way the PDP did, all public spaces would have been shared or sold even before the PDP came to power,” they argued. They expressed their excitement at the state government’s readiness to demolish properties that violated the town planning law of the state and urged the Obaseki-led government to extend the demolition notice to occupants of the school land. The former AGGS students vowed to go to court if the state government fails to act on their complaint and request to take back their school land, an obligation they said, they owe their alma mater. “We know that the beneficiaries are big people but we have thousands of lawyers in our fold and we are battle-ready to reclaim the land which was criminally converted to private use by the former PDP-led government. When they shared the land, little did they know that judgement day would come this soon. It is time to engage them, now that they are out of power. True leaders build new schools, expand the physical space for old ones and not the other way round,” leader of the group, who pleaded anonymity, for security reasons, said. The Edo State Government at the weekend, served demolition notices to developers in Benin metropolis whose buildings breached the state’s town planning laws. Speaking to journalists at the weekend in Benin, the Commissioner for Physical Planning and Urban Development, Edorodion Oye Erimona said the notice serves as a final reminder to those whose properties contravened the state’s laws on urban development. According to him, the exercise became necessary to ensure that the original plan of the city is maintained and ensure safety and convenience for residents, adding that the properties are built on roads, and under high tension cables. He said the state government will continue to engage developers whose properties flout the state’s town planning laws, through notices on contravention, stop work and eventually demolition. The commissioner frowned at the antics of developers, who build structures without regard to appropriate laws, noting that the exercise will serve as a deterrent to developers. “Developers who intend to develop their properties are encouraged to approach the Ministry with their building plan proposals. The ministry now approves proposals for building between three weeks and three months, provided it is in line with the laid down requirements,” he said. Erimona who charged developers in the state to comply with Town Planning Laws said the exercise will be extended to other parts of the state. The post Land grab: AGGS old students seek demolition of houses on school land in Edo appeared first on Vanguard News.